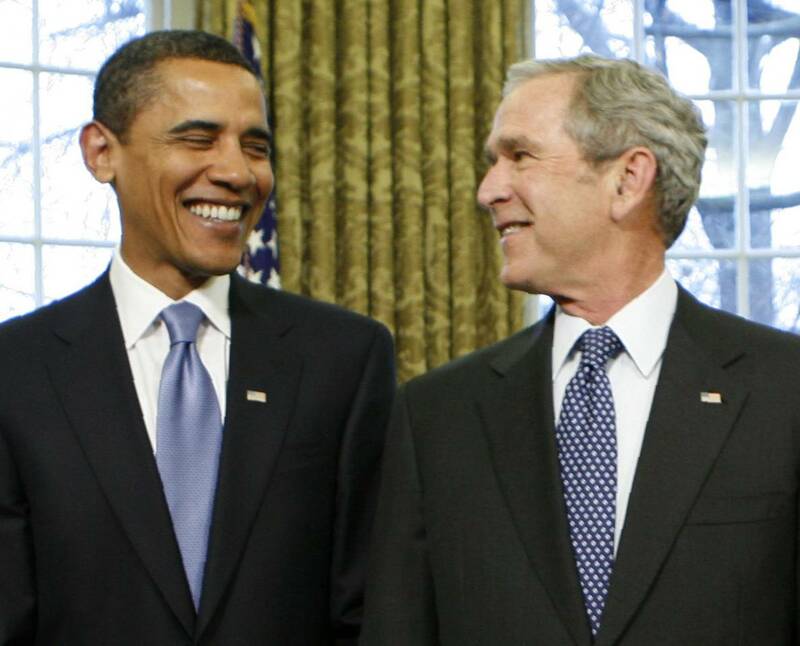 "Haha, we sure fooled them stupid suckers good, didn't we Barack?" "Yes we did, Mr. President, yes we did." "A slide showed Mr Bush in the Oval office, leaning to look under a piece of furniture. "Those weapons of mass destruction have got to be here somewhere," he told the audience, drawing applause. Another slide showed him peering into another part of the office, "Nope, no weapons over there," he said, laughing. "Maybe under here," he said, as a third slide was shown." ("Bush jokes about search for WMD, but it's no laughing matter for critics" The Guardian, March 26, 2004). "A slide showed Mr Obama in the Oval office, leaning to look under a piece of furniture. "Those Syrian moderate rebels have got to be here somewhere," he told the audience, drawing applause. Another slide showed him peering into another part of the office, "Nope, no FSA over there," he said, laughing. "Maybe under here," he said, as a third slide was shown." "DESVARIEUX: Yeah. So, for you, Patrick, what do you see as a solution? COCKBURN: I think the most important thing to do is to try and bring the war in Syria to an end by a ceasefire or some other means. What's destabilized Iraq was the uprising in Syria. Iraq was pretty bad. The prime minister, Nouri al-Maliki, was extremely corrupt, [incompr.] but it was beginning to stabilize in 2011. What destabilized it was the war in Syria, the uprising of the Sunni Arabs there that affected the Sunni Arab minority in Iraq. And I remember Iraqi politicians saying to me over the last couple of years, if this war goes on in Syria, that's it for us. It's going to destabilize Iraq. It's going to restart the Civil War here. And they were dead right. But I said, well, what's the reception in Washington or London or wherever abroad when you mention this? And they said, we're just not being taken seriously."